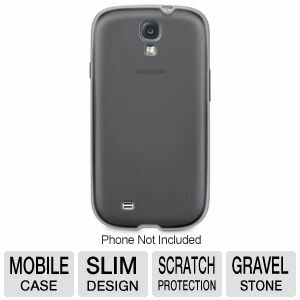 Made of a semi-flexible plastic, the Grip Candy SE Case shapes to your Samsung Galaxy S4 for a shock-absorbent, form-fitting layer of protection. It's called Grip because it makes it easy to keep a grip on your Samsung Galaxy S4, no matter if you're talking, texting, working, or playing. The Grip Candy SE Case is designed to protect the buttons on the sides of your Samsung Galaxy S4 while keeping your ports, speakers, and camera fully exposed. Quickly and easily adjust your volume, plug in your headphones, snap a photo, and connect your charging cable while keeping your case on and your phone fully protected. The revamped design of the case's signature color-contrasting edges makes your Samsung Galaxy S4 even easier to hold. The new dimpled texture on the edge of the case feels great in your hand and helps prevent accidental drops. When you put the Grip Candy SE Case on your Samsung Galaxy S4, you'll notice the edges wrap around your phone ever so slightly. We designed the case this way so that when you place your phone face down on a flat surface, your screen is less likely to get scratched. The matte finish gives the case a velvety smooth texture that is soft to the touch and makes holding and using your Samsung Galaxy S4 that much better. The case even has a hint of color, showing off your Samsung Galaxy S4's design.